NTOABOMA — Chocolate means little to my grandmother. In fact, growing up in the average village that was Ntoaboma in the middle of the country now called Ghana, I knew little of the sugar induced accoutrement of uppity ritual myself. I always received gifts throughout the year – especially when one of my grandparents would return from a journey of about two to ten days away from Ntoaboma. As a child, it felt like lightyears. I would receive new pants, new shirts and new talismans of Krobo beads, when they returned. Agbelikaklo, Kose, Kelewele and Chofee were, of course, the delicacies I grew increasingly accustomed to from my grandparents’ travels. And when anyone asked me what they should get me from anywhere around the globe, I was sure to affirm my utmost distaste for anything else. These special gifts meant the world to me. I was five. But never, ever, in my good memory did I receive a gift in chocolates. I never had the chance to refuse it. Plus, I wouldn’t have known what it was. Which brings me to the day my granduncle, my grandmother’s younger brother, who had not been seen around the village for almost seven years suddenly returned with the pods. It was cocoa. He had become a formidable farmer of the crop in a town some hundreds of kilometers south of Ntoaboma, called Forifori. Little did we know he had made a lovely life for himself. Although Forifori was not even four hundred kilometers away, seven years is how long it can take anyone to find a member of the extended family if they decided to lose themselves amongst the cocoa trees. Alas, what are these pods? I knew even at my young age that these things were not the correct accoutrements. My grandfather would have preferred a Kente cloth, some finely refined Akpeteshie, with matching hats and scarves, facial hair and a good rain on his cocoyam and cassava farm. Anyway, the pods were accepted as a token of appreciation as a traditional man accepts a leopard skin from another brave man who has spent weeks in the forest hunting the dangerous but fine beast. It took another twenty years, and the death of my lovely grandfather, the death of my great grandmother (who I terribly miss) and the death of this granduncle of mine from Forifori to finally understand the content and import of my grandfather’s comment. This year, the global chocolate market will be worth 98.3 billion dollars and my village Ntoaboma would have had a hand in it – notably my granduncle and his children who still farm the crop across the terrain in the Afram Plain regions of Ghana. In the 2015 season, Ghana produced 200,000 metric tons less than the 2014 season of 900,000 tons. 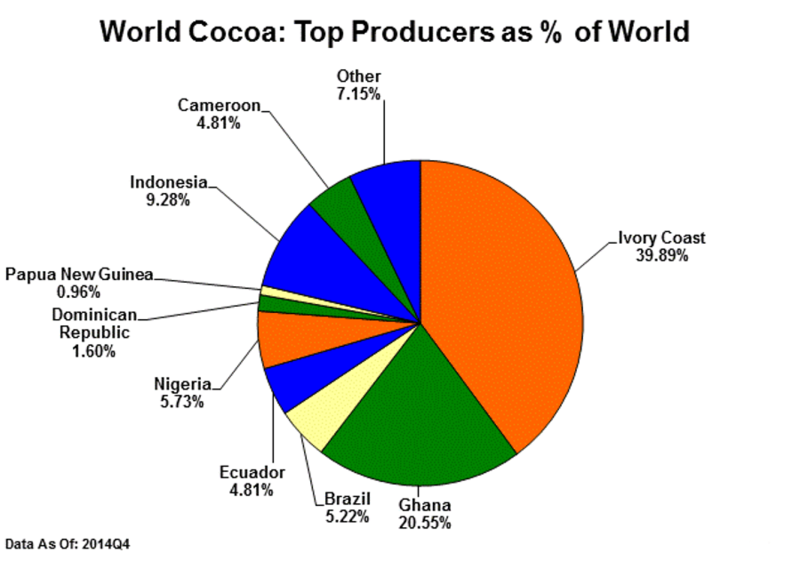 On average Ghana produces for exports about 800,000 tons of cocoa each year. The next question is obvious. How much do Ghanaian famers, like my cousins in Forifori, make from these crops? The Minister of Finance, Mr. Seth Terkper, paid GH₵345 per bag of 64kg gross for the 2015 cocoa season which translates into a GH₵3,392 (1,407 dollars) per ton, while across the border in La Cote d’Ivoire, where about 1.5 million tons of cocoa are produced for the world market every year, farmers there receive a minimum price of 750 CFA francs per kilogram (1,540 dollars per ton). Put together, if Ghana’s farmers rake in 1.13 billion dollars a year, for a nation that produces about twenty-one percent of the world’s cocoa, which is used to produce Chocolates, our farmers can only expect to see 1.2 percent of the global revenue. Refreshing indeed! In 2015, Mr. Seth Terkper announced that cocoa, together with a few other cash crops, account for more than seventy-five percent of our agriculture sector. This number puts our food production into an interesting perspective. The livelihoods of about eight million Ghanaians (that is about thirty percent of the population) depend on the cocoa sector. That is, eight million Ghanaians depend on other countries that make chocolate! What must we do in the meantime in order to live while that part of the world manufactures chocolate? What must we do while the makers of chocolate turn a profit? What must these eight million Ghanaians eat in the mean time? How must they pay for their healthcare and education? 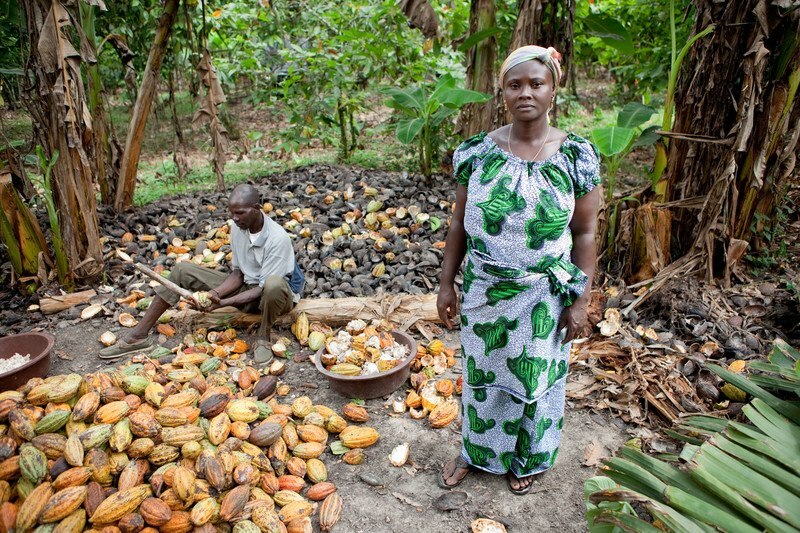 The Ghanaian government has been convinced by western experts that cocoa exports are key in poverty reduction: with surveys conducted in 1991, 1999 and 2005 indicating a reduction in poverty levels among cocoa producing households from 60.1 percent in the 1990s to 23.9 percent in 2005. Against the national poverty rate, which fell from 51.7 percent in 1992 to 28.5 percent in 2006, the number looks good. For this reason, some researchers insist that the sudden decrease in poverty levels in Ghana for cocoa producers coincided with a period of favorable cocoa prices, higher yields and increased production. But cocoa exports account for only 8.2 percent of Ghana’s GDP. That means that Ghana made only 5.7 billion dollars from cocoa. That stands at a paltry 5.8 percent of all what the chocolate industry is worth, although Ghana produces twenty-one percent of its cocoa. Fascinating! So how come for a crop that contributes only 8.2 percent towards our GDP we dedicate more than seventy-five percent of our arable lands towards its cultivation? How come for a crop that takes up seventy-five percent of our farmlands and is not consumed in Ghana or any part of Africa, we invest so many resources in its production? The answer lies in all of those prism-shaped Toblerone bars in airport duty free shops across the world to the more local Cailler and Frey varieties. Every year, the Swiss people consume on average just under twenty lbs of chocolate per person. 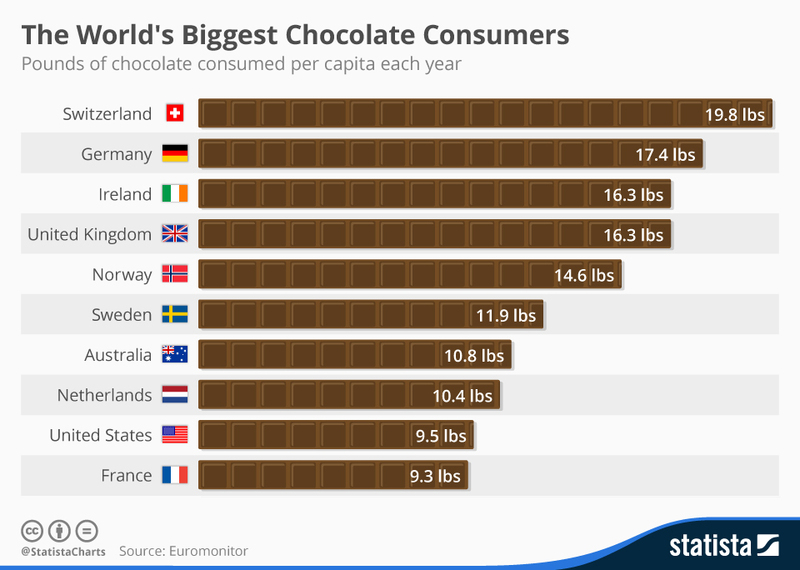 The United States struggles to compete with Europe in the chocolate consumption league and it comes in ninth overall – the average American eats about 9.5 lbs of chocolate each year. So, of course, chocolate means many things to these people in the west: it can be a special treat, a guilty pleasure or a delicacy to be mulled and evaluated much like wine. But for many people in Ghana, it’s a strange industry with very little return on the investment. 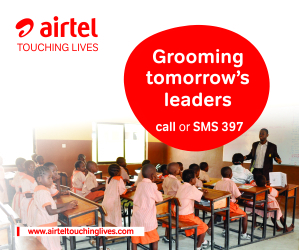 Many Ghanaian children have barely had a cold drink of chocolate in their entire childhood lives. I never had one. Even my granduncle – the cocoa farmer – never had one and he died. Hence, for all the resources we pour into producing this crop, and the little we receive from it, it beats no mind to consider what a Slave Sugarcane Plantation might look like in the twenty-first century. 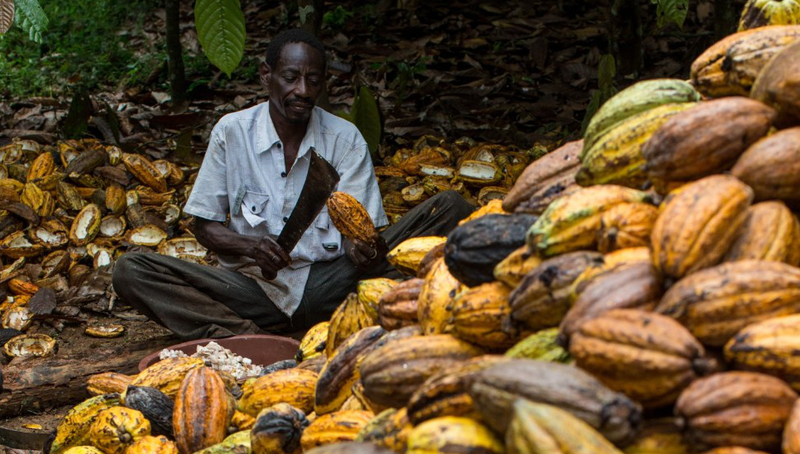 Ghana and La Cote d’Ivoire are cocoa plantations alright producing a crop the only goes to satisfy the chocoholics of the West—in the same way the Americas were used, with the forced labor of brutally enslaved Africans, to produce the sugar for western habits. Nestlé was recently embroiled in a new controversy as the company went public with the admission that slave labor had been found in the multinational company’s supply chain in La Cote d’Ivoire on several cocoa producing plantations. In Ghana, the impact is clear. Even the road from Forifori to Ntoaboma, which is why my granduncle could vanish for seven years, cannot be paved adequately without selling these cocoa beans to these nations in the West in return for foreign reserves before we can pay people in Ghana to come and work on a feeder road. This kind of economic thinking – a European economic paradigm meant to keep Forifori enslaved on a plantation to satiate western gluttony – cannot afford Ghana the opportunity to grow and become sustainable. The numbers described every year in Ghana’s Budget, a pachydermatous script, are bafflingly interesting, but they are as treacherous as the old Baluba proverb that is: The skin of the leopard is beautiful, but not its heart. These western nations, no matter how they slice and dice the issue surrounding poverty reduction in Ghana – which we can amply do without committing our resources to cocoa production – are not interested in Ghana’s economic development and her subsequent sustainability. They are leopards gallivanting the continent for prey. And they come thumping some very ugly, heavy hearts about cocoa production. The pod my granduncle brought back from Forifori, which my grandfather branded as ‘leopard skin,’ speaks to this reality. It turns out that my grandfather’s joke, after all, was a serious one. In fact, it was an inquisition – an inquiry into the stupidity of the economic minds in Africa, the garrulity of Ghanaian policy makers, and with it, the pettifoggery of western experts. Posted by Above Whispers on February 13, 2016. We have a sizzling crisis!